When Morgan Stanley's chief equity strategist Michael Wilson released his 2018 equity outlook earlier this year, one particular observation struck us: a curious correlation between volatility and the shape of the yield curve we had not seen anywhere previously. In his discussion in late November 2017, Wilson explains why he expected bigger volatility in the coming year, and why he thought"things will change in 2018" he shows the following chart which illustrates an interesting relationship between equity volatility and the economic cycle. It shows that the 2s-10s yield curve tends to lead the VIX by 2 ½ years. You will notice that in the past 6 months, this impressive 25 year relationship has broken down with the VIX continuing to significantly fall even though the curve flattening that began 3 years ago would have suggested a rise by now. We think this is a reflection of the very supportive fundamental environment described above and the "give up" by traders who have succumbed to the trend and even turned to methodically selling volatility. Furthermore, many retail products have been created to sell vol and may have exacerbated the trend and overshoot to the downside. As economic data and earnings estimate dispersion increases next year, the underlying trend will likely reverse and these products will only serve to make the reversal more persistent than what we have experienced the past few years. 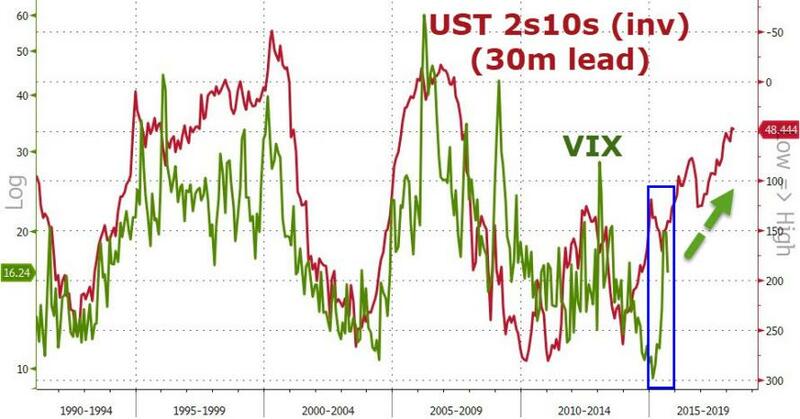 At the time we noted that the chart Wilson is referring to should lead to a few sleepless nights for those who keep selling vol on even the smallest of VIX spikes. What it indicated, in November 2017, was that if historical correlation is maintained, the VIX should be just shy of 30 within a few months, (a level we said would have catastrophic consequences for virtually all vol-selling funds, including retail investors, active at the time). VIX did indeed explode higher in February, recoupling with the lagged Treasury yield curve's ever increasing flatness. Back in August when many market participants were worried about low volatility as we entered the seasonally weak time of the year, we made a case that equity volatility should be low and was not a sign of investor complacency. Instead, we cited low interest rate, currency, credit and economic data volatility combined with very low earnings estimate dispersion as good reason for low equity volatility; and we implored clients to embrace it rather than fear it. We stand by that claim and call today, but acknowledge several of these factors are likely to change in 2018. First, interest rate volatility is likely to increase as the Fed continues to tighten and the ECB begins its tapering process. Exhibit 16 clearly illustrates that the combined impact of global quantitative easing programs peaked in 2016. Furthermore, gross issuance of sovereign debt bottomed as populism began to force the hand of politicians to back away from fiscal austerity – our key insight last year for why equity valuations would rise rather than fall as populism took hold. What this means is that between 2016 and 2018, the net issuance of sovereign debt should increase by over $1 Trillion. This is bound to have an effect on interest rate volatility even if rates remain low in 2018. Second, credit volatility is also likely to increase in 2018. In fact, credit spreads have been rising lately as we are seeing more sectors struggle with their debt loads and deteriorating fundamentals – Telco, Healthcare and Retail specifically. We suspect the credit cycle may have topped in the US again with a classic double bottom in spreads after an exceptional recovery from the energy debacle in 2014-15, a view shared by our credit strategists. Third, economic data is also bound to see an increase in volatility from what is now an extreme reading of positive economic surprise . In fact, there has rarely been a period of such synchronous accelerating growth which was one of the key tenets of our bullish view for 2017. These periods rarely last particularly when various economies are at such different stages of recovery. This doesn't mean recession, however, it does mean higher economic data volatility which subsequently leads to higher FX volatility. Finally, earnings dispersion is currently at a 40 year low (Exhibit 18). We don't think it takes a complex algorithm to understand there is a much higher probability this rises rather than falls in 2018, particularly given our view on decelerating growth, rising interest rate and credit volatility, higher oil prices and tightening financial conditions generally. So between the correlation chart and its qualitative forecasts, Morgan Stanley's conclusion is that "after a very painful slide in volatility for many traders looking for a rise the past several years, we have finally reached a point where betting on higher volatility will pay off." And while the bank had "been loath to make this call the past few years" it recommends going long vol now "as a means of protecting one's portfolio in the latter stage of this late cycle move."